In the last section, we introduced the difference between real measurements and nominal measurements of the same economic statistic. On this page, we explore this challenging, but important, distinction in more depth. Table 1 shows U.S. GDP at five-year intervals since 1960 in nominal dollars; that is, GDP measured using the actual market prices prevailing in each stated year. This data is also reflected in the graph shown in Figure 1. Figure 1. U.S. Nominal GDP, 1960–2010. 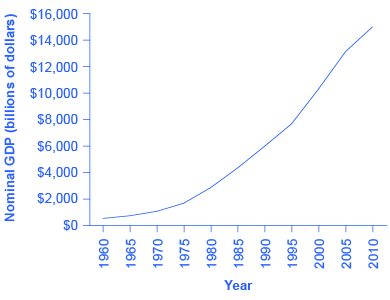 Nominal GDP values have risen exponentially from 1960 through 2010, according to the BEA. We’ll call this the Real-to-Nominal formula. Watch this video to see an example of how inflation can distort our perception of GDP. In this example, we focus on a simplified economy with only one good: apples. So, we appeared to be producing 20% more apples, but in reality we were only producing less than half that or 9.1%. Year Two’s real GDP in dollars is $1091. If prices were held constant, the growth in GDP would have been $91, and not the $200 implied by the nominal GDP. Nominal output is the value of what’s produced, while real output is the quantity of what’s produced (in the previous case, pounds of apples). If we produce more apples we can say our real output has increased. Now suppose our apply economy from above now produces two goods: apples and xylophones. It’s easy to compute how much nominal GDP has increased. In year one, the value of apples produced was $1000, and the value of xylophones produced was $1000, so nominal GDP (assuming these are the only two goods in the economy) was $2000. Similarly in year 2, the value of apples produced was $1200, and the value of xylophones produced was $1800, so nominal GDP was $3000. Thus, nominal GDP increased by $1000 (the increase)/$2000 (the nominal GDP in year one)= 50%. But what has happened to real GDP? Real output of apples has increased from 2000 lbs to 2182 lbs. Real output of xylophones has increased from 100 to 150. How much has real output increased? Can we say that Real GDP has increased from 2100 to 2332 items? The answer is no, because it doesn’t make sense to add apples & xylophones together, since they are used for different purposes and have different values. What we need is a common denominator, which would allow us to compare apples and xylophones. The common denominator economists use for this purpose is price, since price reflects the value of what something is worth. In other words, we compute real GDP in every year using the prices that existed in a single year, in this case year 1. That’s why real GDP is often described as being based on “constant dollars” or “year one dollars”. In other words real GDP increased by $591/$2000 = 29.6%, which is significantly less than the increase in nominal GDP of 50%. Why does the distinction between real and nominal GDP matter? We explained earlier that nominal measures are distorted by the effects of inflation. Thus, nominal GDP inflates the actual quantity of goods and services produced (i.e. real GDP) making it look bigger than it really is. Let’s think of this another way. Real GDP is highly correlated with employment and the standard of living. When real GDP increases, we tend to have more jobs and more goods and services to consume. When businesses need to produce more goods and services, they typically need to hire more workers, which means incomes are up. By contrast, when inflation drives nominal GDP up, there may be no effect on jobs and the standard of living. If businesses are producing the same quantity of goods and services, they don’t need to hire more workers. The same quantity of things just cost more. the nominal value of some economic variable (e.g. GDP) is the price level times the real value of that economic variable.